We’re forever finding new places to explore on our travels, and some of the best are right here in the United States. 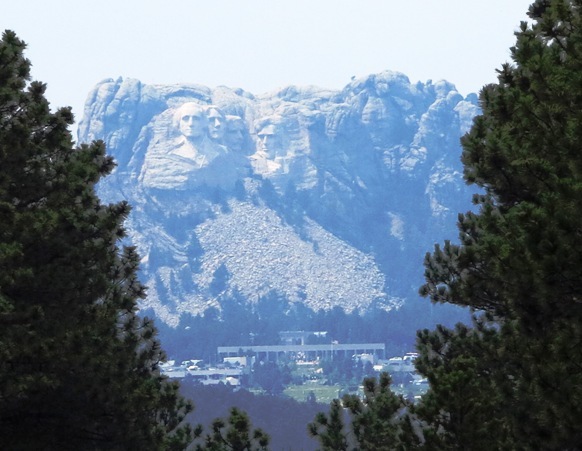 Last summer we drove across South Dakota to see Mount Rushmore National Monument and then head to Badlands National Park. 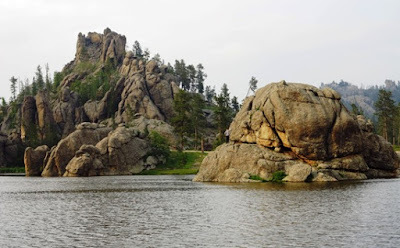 Along the way we discovered an absolute gem—CusterState Park. 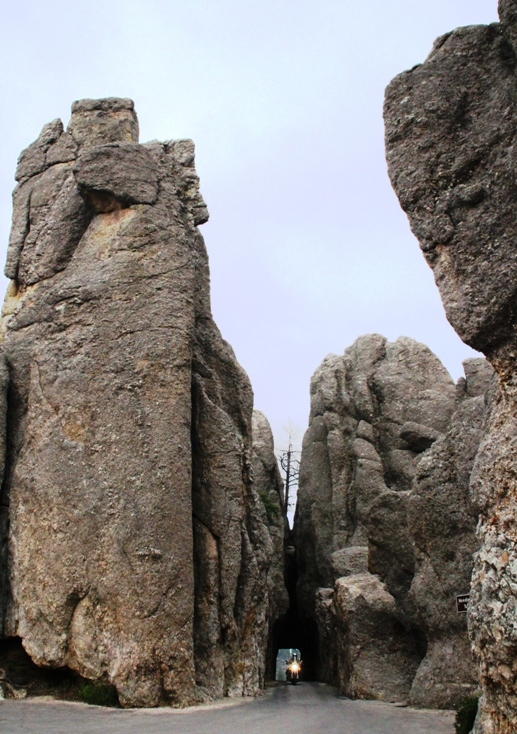 Although it’s a state park, we decided Custer could easily have been named a national park. It has so much to offer—an abundance of wildlife that can be seen in their natural habitat; plenty of hiking trails for all skill levels; lakes and streams for swimming, boating, and fishing; on-site lodging, and three stunning drives that I’ll describe here. There are six tunnels, some with no by-pass, so visitors in large vehicles should check clearance before starting the drives. Cathedral Spires near the end of the hike. 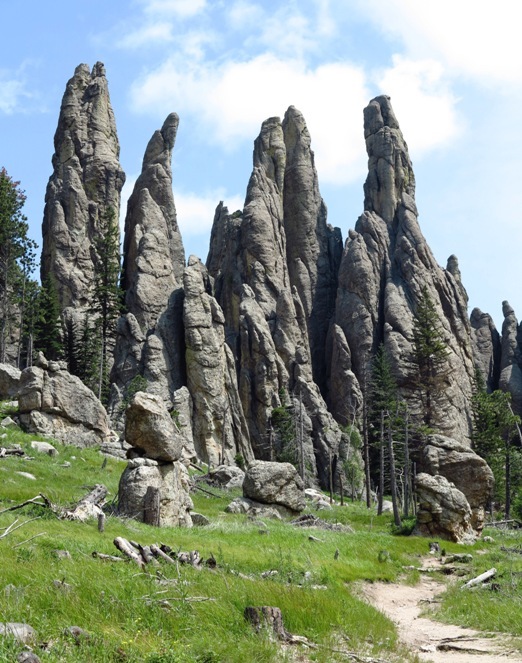 Named for the needle-like granite formations that reach for the sky, this 14-mile road winds through pine and spruce forests and meadows surrounded by birch and aspen. Plan to spend at least an hour driving the road because you’ll want to stop often and take photos. It’s also very curvy; a safe driving speed is no more than 25 mph with signs often posting limits of 10 or 5 mph. One spot to look for is the Needle’s Eye, a tall rock with an oblong opening created by the forces of wind, rain, freezing, and thawing. Tunnels have been cut through the mountains in many places, and you’ll find two of these on the Needle’s Highway. 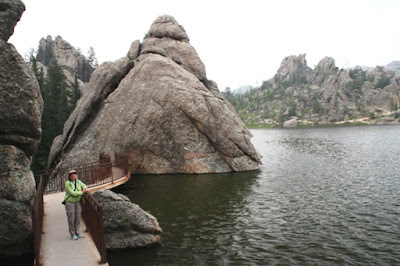 Our first stop was Sylvan Lake, a beautiful lake surrounded by many large rock formations. A mile-long hike, which we walked the first evening, takes visitors around the lake. Rock formations surround Sylvan Lake in Custer State Park. 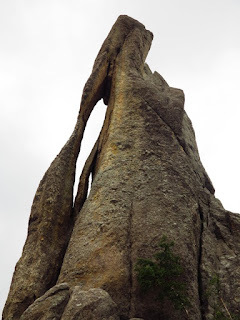 Rugged granite mountains form the backdrop for this drive, and when we came to the Cathedral Spires trailhead, we decided to come back the next day since it was almost dark and hike three miles round trip to see the namesake spires. if you don't look up! At the Visitor’s Center named for Peter Norbeck, we learned that he was responsible for creation of this spectacular highway. Norbeck marked the entire course traveling on foot and horseback, making sure to choose the most scenic turns. Construction, including two no-pass tunnels, was completed in 1922. We purposely drove to Mount Rushmore from the south on US 16A because exiting a tunnel on Iron Mountain Road provides the first glimpse of the carved presidents’ faces. The day was hazy when we drove this way, but it truly was exciting to see the carved mountain framed by the rock tunnel. Only a portion of this 18-mile road lies within Custer State Park, but it’s definitely worth driving (again allow plenty of time) for incredible Black Hills scenery and several tunnels blasted through the mountains. Don’t miss this magnificent highway, which was constructed in 1933.
the tunnel on Iron Mountain Road was a thrill. Custer State Park is one of the few places in the world where you can see bison, white-tailed and mule deer, elk, bighorn sheep, pronghorn, and prairie dogs and other species in their natural habitat. The main road winds for 18 miles through grasslands and pine-speckled hills with numerous gravel side-paths taking adventurous visitors to more remote parts of the park. Curvy roads serve to keep speeds under 35 mph. 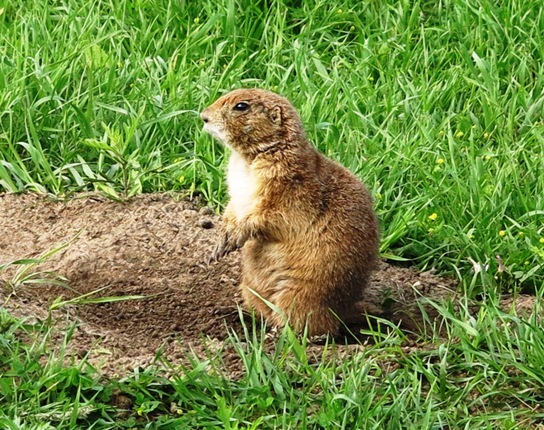 Hundreds of prairie dogs were scattered in the grasslands. We started our drive shortly after 8:00 a.m. since the best times to see wildlife are early morning and evening. 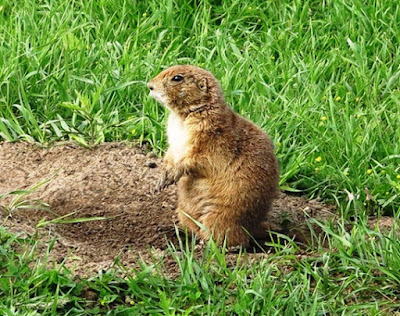 We passed a prairie dog town, stopping to watch the critters scamper in and out of their mounds. They nibbled on flowers and seeds and churned up the dirt, which keeps the grasslands healthy. on the Wildlife Loop in Custer State Park. 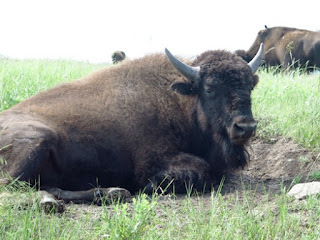 When we took a side road called Oak Draw Road through the Norbeck Wildlife Preserve, we passed many jeeps with guests on buffalo safaris. But it wasn’t necessary to have a guide as we came upon several large herds. Near the Wildlife Station Visitor Center in the southeast part of the wildlife loop, we saw hundreds of bison, so we stopped and observed them for quite a while. From a ranger we learned that family groups are determined by the grandmother, and the park keeps the herd at a manageable number as determined by rainfall amount. Currently the herd numbers about 1300. 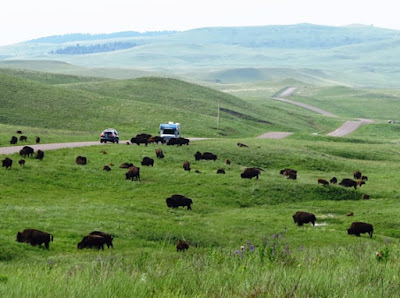 Herds of bison/buffalo roamed the Wildlife Preserve.